Ouray County is located in southwestern Colorado and is nestled into the corner made by the San Juan and Cimarron mountain ranges. It is about 550 square miles, and is home to around 4,500 full-time residents. Log Hill Mesa is one of two mesas overlooking the town of Ridgway, a quaint crossroads where people know each other, most of the streets are still dirt, and the views breathtaking. It’s an artist’s community with a vibrant evening scene — and is growing rapidly. Log Hill affords incredible views of the San Juan Mountains, most particularly the Sneffels Range to the south, dominated by the 14,158′ Mt. Sneffels (the highest point in the county, pictured in the header), and the Cimarron range to the east-southeast. These two ranges meet in a gorgeous tight valley; at the end of that valley is the lovely Town of Ouray, the “Switzerland of America”. Especially lucky Mesa residents can also see Horsefly Mesa to the west, and Colorado’s Grand Mesa to the north. On the south end of Log Hill Mesa are several homesite developments, with several hundred lots of 1-10 acres each. Elsewhere on the mesa, lots tend to be 35-120 acres, serviced by a number of county and private roads. All told, there are as many as 2,500 residents on Log Hill — more than half of the county’s residents. Visitors can find more information at the Ridgway and Ouray info sites. This site is run by Log Hill resident Randy Cassingham, an author and publisher. He writes This is True, a weird-but-true news feature. His other web sites include “Randy’s Random” (featuring thought-provoking memes), a primer on how to get rid of spam, and he is the creator of the Get Out of Hell Free card (and associated stickers and other items). ©2003-2019 ThisIsTrue.Inc, all rights reserved. 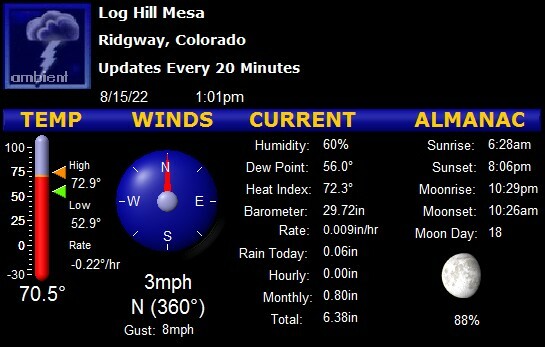 Local Weather Sponsored by This is True, Located on Log Hill Mesa, Ridgway, Colorado.